Arabic Poetry Aesthetically Enough to Raise Your Poetic Language! Arabic Poetry to Raise Your Poetic Language, Aesthetically Enough! 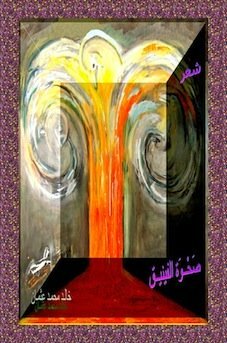 The Arabic Poetry couplets here and on some more than 30 pages are written and designed by the poet in beautiful pictures, as templates backgrounds. The poet has done that taking snippets of his poetry from his collection to provide in beautiful design in the internet rush time basically to YOU to aesthetically raise your poetic language. 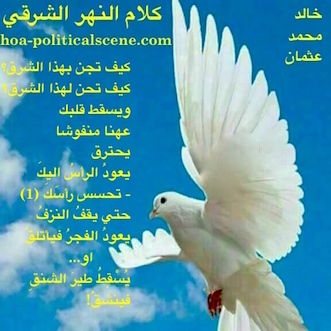 hoa-politicalscene.com/arabic-poetry.html - Arabic Poetry: Snippet of poetry from "Speech of the Eastern River" by poet and journalist Khalid Mohammed Osman on beautiful white bird. Among them are English HOAs Poetry. The English poetry are by the poet and other poets including a fellow Ethiopian poet. hoa-politicalscene.com/arabic-poetry.html - Arabic Poetry: Snippet of poetry from "The Sea Fetters in Its Blood" by poet and journalist Khalid Mohammed Osman on beautiful sea. 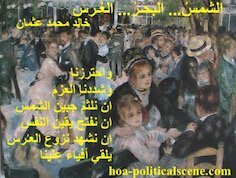 THAT is to say Arabic and English poems on the HOA Political Scene linked from within the Arabic HOAs Poems wether they are Arabic Poetry Posters or other Arabic HOAs Poetry are all inspirational to the standard that enables you to see vibes and become full of anxiety to write your own poetic expressions. 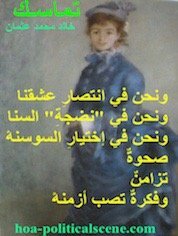 The Arabic Poetry Posterized for the First Time! Many HOAs Imagery Poems, and other poems in English, such as those poems you read at the HOAs Animation Gallery, the HOAs Design Gallery, the HOAs Gallery and the HOAs Photo Gallery are designed in snippets to respond the fast tempo of life, where every body is in a hurry. 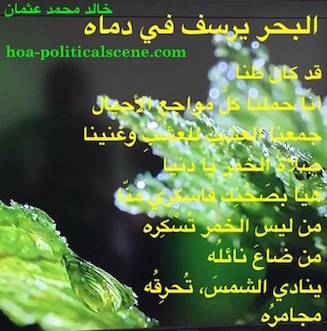 hoa-politicalscene.com/arabic-poetry.html - Arabic Poetry: Snippet of poetry from "The Sea Fetters in Its Blood" by poet and journalist Khalid Mohammed Osman on beautiful dew watering leaves. However, many of the poetry are not new. 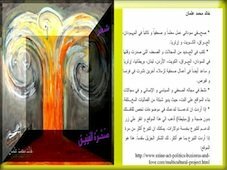 They are published in two books by the poet as you could see through the page and at Arabic Phoenix Poetry and Lulu. 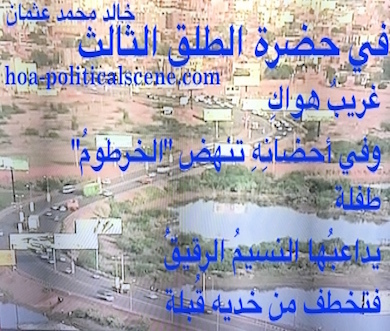 hoa-politicalscene.com/arabic-poetry.html - Arabic Poetry: Snippet of poetry from "In the Presence of the Third Parturition" by poet and journalist Khalid Mohammed Osman on beautiful view of Khartoum. The beautiful pictures could also be interesting to you to print and hang them on your saloon, cafeteria, club, bar, restaurant, or other good places. 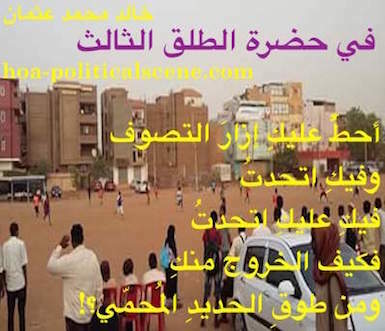 hoa-politicalscene.com/arabic-poetry.html - Arabic Poetry: Snippet of poetry from "In the Presence of the Third Parturition" by poet and journalist Khalid Mohammed Osman on Khartoum football league. hoa-politicalscene.com/arabic-poetry.html - Arabic Poetry: Snippet of poetry from "Dancing in the Fancy of Roses and Lemon" by poet and journalist Khalid Mohammed Osman on beautiful star. Everyday you look at them at HOA, HOA Index, or pay attention to the HOA Calls and read very special wording in poetry, all of that adds to your vocabulary. As you see, although this invaluable, but it is not only that. 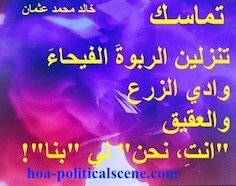 hoa-politicalscene.com/arabic-poetry.html - Arabic Poetry: Snippet from "I Call You Samba, I Call You A Field" by poet and journalist Khalid Mohammed Osman on beautiful Ethiopian woman making coffee. Everything that adds to your vocabulary adds also to your imagination some additional visionary thoughts to use your language perfectly any time and not only when you are about to create any kind of art, or literary work. 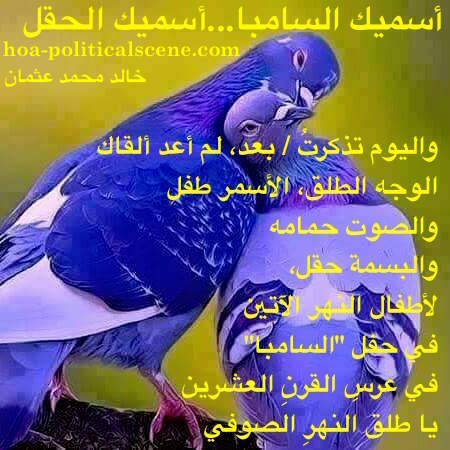 hoa-politicalscene.com/arabic-poetry.html - Arabic Poetry: Snippet of poetry from "I Call You Samba, I Call You A Field" by poet and journalist Khalid Mohammed Osman on pair of beautiful doves. 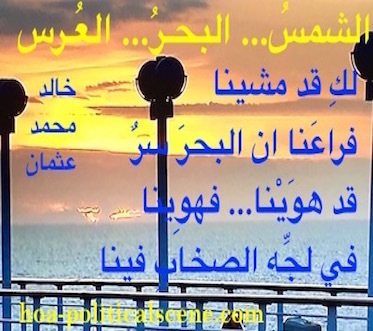 hoa-politicalscene.com/arabic-poetry.html - Arabic Poetry: Snippet of poetry from "The Sun, the Sea, the Wedding" by poet and journalist Khalid Mohammed Osman on beautiful sunset over the sea. Repeating, or murmuring the phrases makes your thoughts goes into language and pick up the pictures they make into your mind. This is a value, as you see through it the aesthetics of your language and then use it in your work. Other cultural resources are included in the HOA Cultural Project, which contains HOAs Journalists, HOAS Journalists Project, HOAs Poets, HOAs Poets Bookshop, HOAs Poets Project, HOA's Self-Publishing, Horn of Africa's Bookshop, Horn of Africa's Journalists, Squadron of Poets. The cultural project is part of the project in the Horn of Africa's Network, which includes also humanitarian projects and political projects all of which are for the Horn of Africa to rebuild it as the United States of the Horn of Africa. Those projects include the Humanitarian Network's project at HOAs Refugees with HOAs Refugees Project and the political projects at USHA with the USHA Framework. For comments, or literary works use the form below. You can upload pictures too. When you do get the books you find in the second page and enter your email address to receive notifications about the publication of your work and any comments readers write good. Share Arabic Poetry with your family and friends. Thanks.